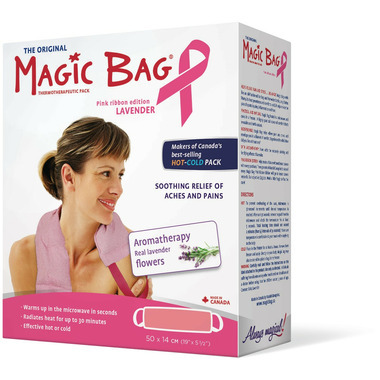 Enjoy the combined benefits of a hot/cold pack and aromatherapy with Magic Bag Lavendar Wrap. Lavender has calming and restorative properties. Imagine all the benefits of a Magic Bag combined with the exquisite, relaxing scent of lavender. This Magic Bag is filled with real lavender flowers. The Pink Ribbon Edition Magic Bag features practical straps to help you hold it in place. You'll never want to go without! Love it but burn too easily.. this is my third one. Love this product. My massage therapist recommended I get a Magic Bag to help with neck and shoulder pain from sitting at a computer all day at work and this one has been great. I also really love the lavender scent, it's very relaxing. I've been using this daily for six months now, and it has been so helpful for neck pain and relaxation. I even use it on my face for TMJ pain. Now it is worn out and the seeds inside are falling out, so time to get a new one! The handles are a nice bonus on this lovely product. The lavender smells amazing but the scent only lasts for the first month or two of use.